It is always a pleasure to find old vintage zinc and enamelled containers at car boot sales, flee markets, Etsy, ebay or loppis. Some people say you can't have too many! I guess your limit depends how much storage you have. Old zinc and old enamel are two materials that age gracefully. A few little dents and even chips does not matter too much. It is a lot of fun to have a few at hand when you want to make a flower arrangement or hide an ugly plastic pot. Strong colours like these purple Alliums looks great against the ﻿matt grey of the zinc. 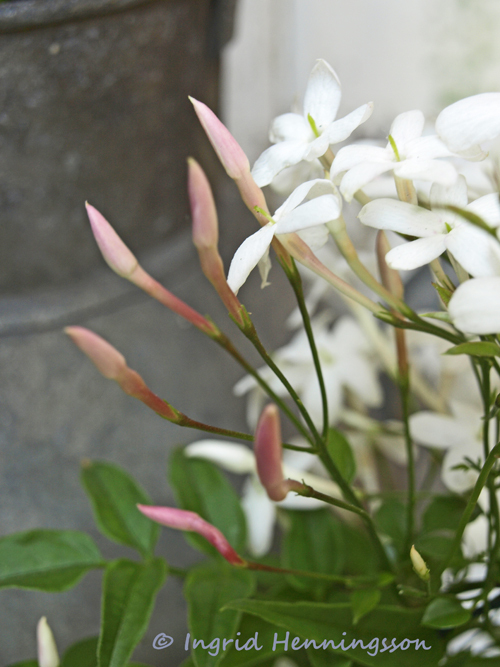 White Jasmine with delicate pink buds also shows up well against the mellow grey. I put two different fragrant thyme in the zinc draw. The beautiful Jasmine went in a French enamel container still with its charming writing on it. Have a sunny day where ever you are! I really love zinc pots and boxes. I just bought one zinc box and one zinc watering can. Couldn´t resist them :) Your photos are amazing! Detta var verkligen i min smak! Vacker zink och stilfullt men samtidigt enkelt sammansatt. I really liked this - a little bit rough and beautiful at the same time. Ingrid, these arrangements are so lovely, with their explorations of how pink, silvery grey, gentle greens and creamy whites can yield original combinations. Over here in New York, year ago, it was possible to come across delightful old items in flea markets or casual antique markets. Nowadays, I when I walk though similar (but not anywhere nearly as richly stocked) markets, I usually think ... hold on, I have something at home that is more interesting that this bunch. Let me just go get myself some white, or red, or pink flowers, or some greenery with some ooomph. I can do something with what I have. Yet. When I see a post like this one of yours, I realize that I can definitely use some inspiration. 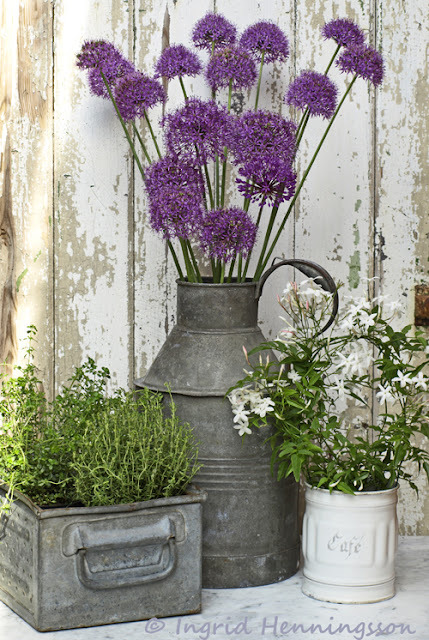 your zinc pots are soooooooooo beautiful and the flowers inside...looks great tht lilac of the Allium and the grey...love it !!! I have a case of I want 'ems. Oh what a nice idea! Very beautiful! So happy to have found you to follow! Did you do this post just for me? 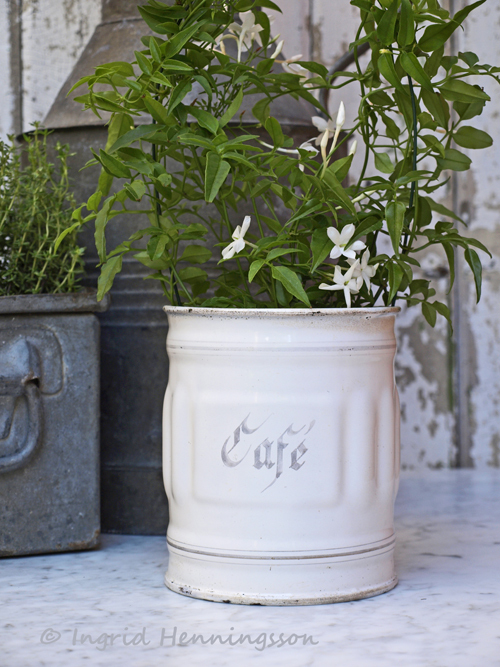 :) I love zinc and enamel pots! The purple allium are so beautiful when they come out. 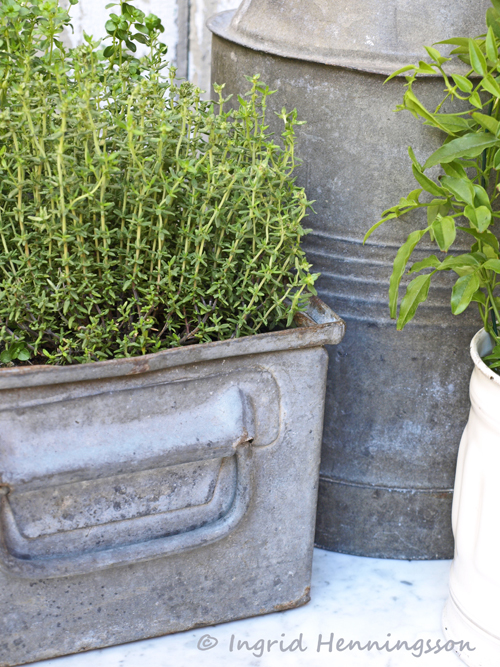 I love to hit the flea markets to look for all kinds of interesting containers to hold my herbs. What you've created is always beautiful. This is really photography at its best. 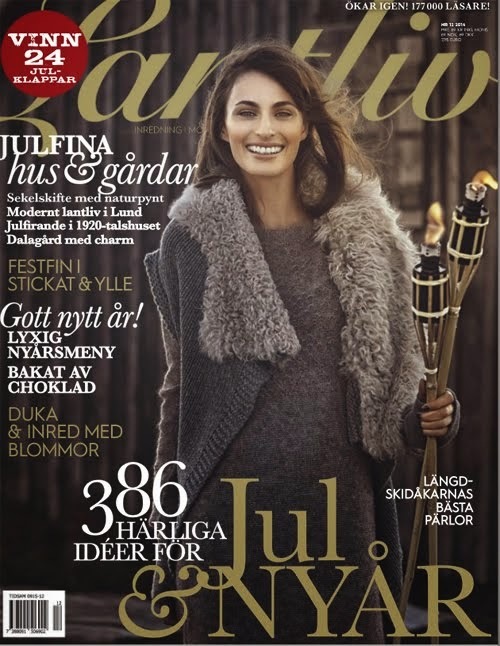 Stopping by for my dose of gorgeousness, and I am never, ever disappointed Ingrid! You are amazingly talented in your composition and photography! 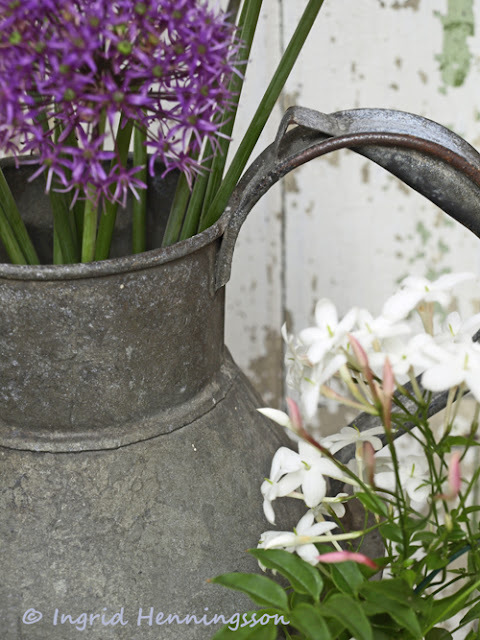 I have a collection of old watering cans and old milk jugs offered by my love .. I agree with you, lots of charm as zinc! Beautiful...these picture are made in your garden??? i am in love...i am dreaming to have my own garden with lots of flowers. Love these zinc and enamel pails too. Been thinking of what to put in front of our flower shop. The zinc buckets filled with potted flowers will look great. Dearest Ingrid, such gorgeous display and i love these containers...so beautiful! Happy mother's day and i hope you had a lovely merry happy celebration! Love to you! Gorgeous photos. I don't know much about zinc pots (other than they're pretty) so would aging zinc seep any harmful chemical into the dirt poisoning the plant or should I only plant certain types of plants in a zinc pot? I've got a few old zinc pots laying around but I don't want to kill anything, kwim!?! 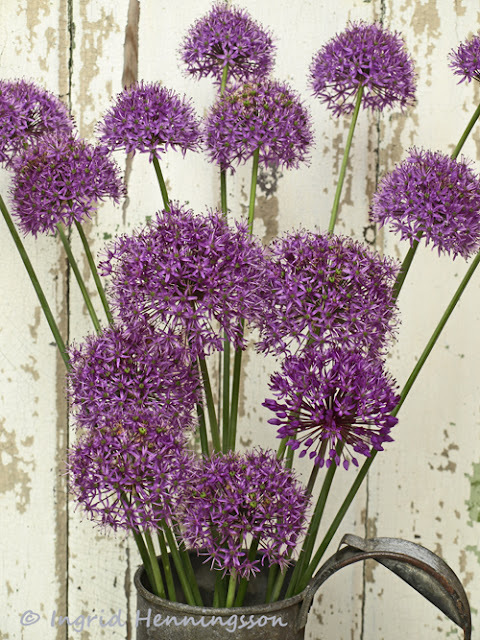 The zinc containers are such classic elements and allium are one of my very favorites in the garden. I never want to cut them, though! But this looks so great, I'll have to give it a try.